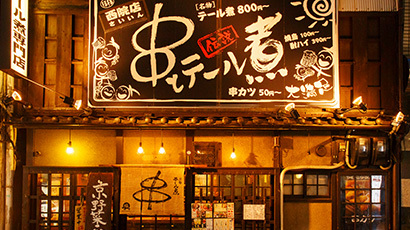 Welcome to Skewers & Stewed Tail SamaSama, a Japanese-style pub where different sorts of people can get together and enjoy themselves, a place for relaxing in a nostalgic Japanese atmosphere. Here you can enjoy our famous stewed oxtail and a large number of skewer-cuisine dishes. 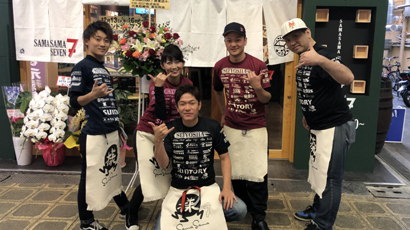 We hope you will drop in to experience our tastes, economical prices, and hospitality, which we offer from our heart so that all of our customers will enjoy themselves. 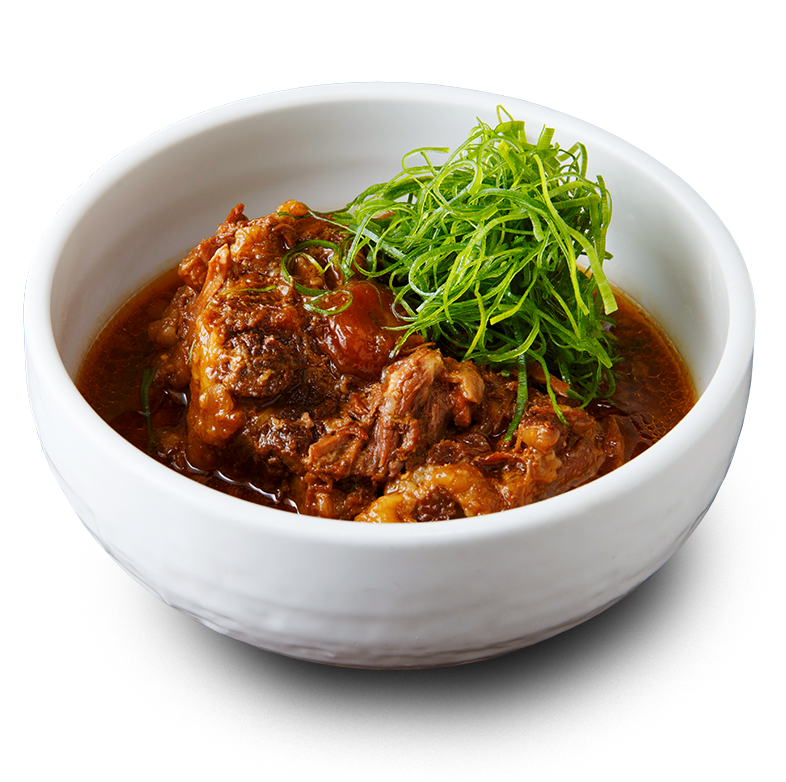 And so that even more people can enjoy themselves here, we are open until 5:00 a.m.
Stewed oxtail is a premier masterpiece dish created by the founder of Skewers & Stewed Tail SamaSama over the course of long years spent in the restaurant business. Searching for a delicious dish that would please people, he overcame difficulties and failures until his quest finally ended in the discovery of this dish, the specialty of the house. We are justly proud of this dish, and we are sure it will bring a smile to your face. While the beef that is most widely stewed elsewhere is beef tendon, at our pub ? as its name itself indicates ? we stew the tail. The tail is the part of the body that moves the most, and stewing it preserves all its flavor and makes it very soft, so that it melts in your mouth, fills you, and makes beer go down great! Be sure to enjoy our stewed oxtail over drinks! Note: The photo shows a medium portion. We stew the tail in our secret, original sauce for eight hours. But eight hours of stewing will not necessarily make oxtail fluffy and pulpy. For that, just the right timing and heat are required, otherwise the meat will separate from the bone and you will be left with something unpalatable that is hardly stewed beef. In order that the stew will be tasty, at our pub only fully approved staff members are permitted to do the stewing. It is precisely because we pay attention to detail that we are able to offer you a taste that is the same every time. The other main line of cooking here ? also found in the name of our pub ? 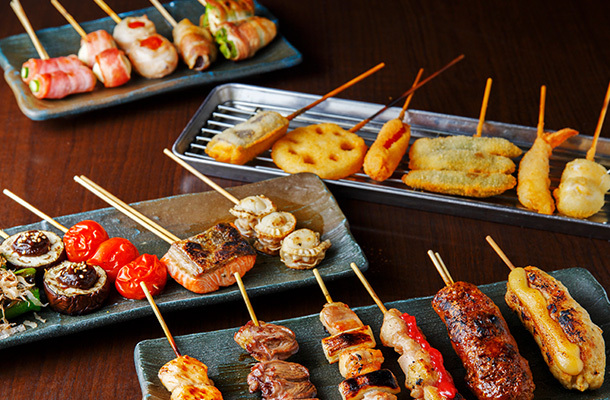 is skewer cuisine. We offer a variety of skewer dishes, everything from grilled chicken and chicken meatballs to pork cutlets and grilled foods. We are committed to serving you grilled dishes that are grilled over charcoal, and deep-fried dishes that are freshly fried and crispy. 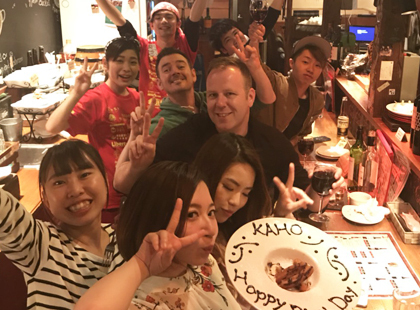 We offer a large variety of dishes of each type, making our pub an enjoyable, popular place for young and old, for men and women alike. Note: All prices shown are before tax. Note: The menu indicated is an example. 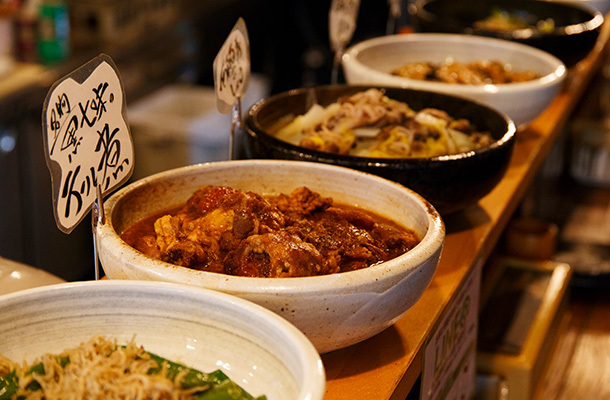 Kyoto is famous for its obanzai cuisine. 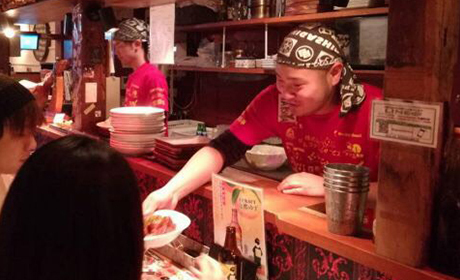 At each pub, our chefs prepare 5?6 different types of obanzai per day. 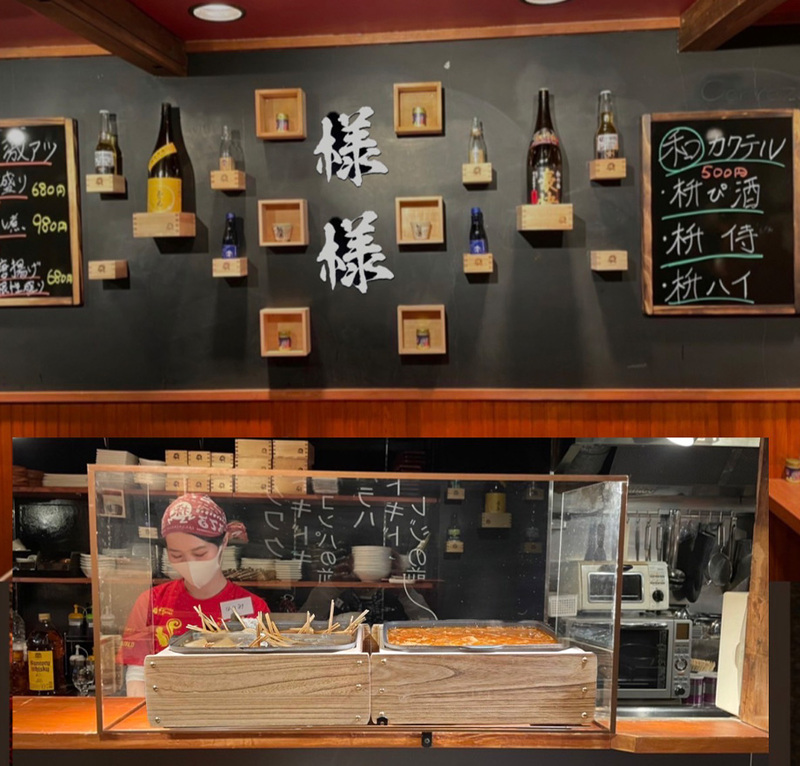 They are made using Kyoto vegetables and fresh, seasonal ingredients, so they offer you the chance for a new discovery: to experience the seasons, one by one. You'll want to come in and try an obanzai even if you are dining alone. 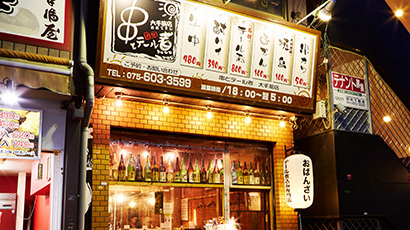 It is a 1-minute walk east from Kujo Station on the Karasuma Subway Line. It is a 10-minute walk from Kyoto Station. From Hankyu Saiin Station, walk 2 minutes to the south. At the second street, turn west, and it is the second establishment on the street. Go west along Otesuji Shopping Street. It is a 5-minute walk from Fushimi-Momoyama Station on the Keihan Main Line Go west along Otesuji Shopping Street. 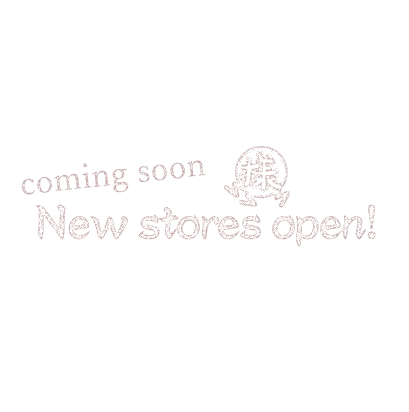 After passing the arcade, turn left and it will be the third establishment on the street. 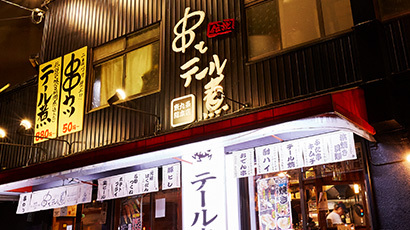 Spain Bar SamaSama is located on Kiyamachi Street. The menu features pinchos, tapas, open sandwiches, and more, and you won't want to miss out on our incredible stewed oxtail. We also offer a full menu of drinks, including wines and sangrias. It's a great place for a date or for a women's night out. ・It is a 4-minute walk from Sanjo Station on the Keihan Main Line. ・At the Sanjo Kiyamachi intersection, go south, and you will see it next to Sazankatei. Look for the big barrel in front of the pub. 5:00 p.m. － 3:00 a.m.